Paleontologists at North Carolina State University have determined that a 68 million year-old Tyrannosaurus Rex fossil from Montana is that of a young female, and that she was producing eggs when she died. The proof, they say, is in the bones. The Tyrannosaurus rex known as B. rex has now yielded bone tissue that is common in female birds, said Mary Higby Schweitzer, a paleontologist at North Carolina State University and the North Carolina Museum of Natural Sciences. A former graduate student at Montana State University, she is at MSU for the summer. 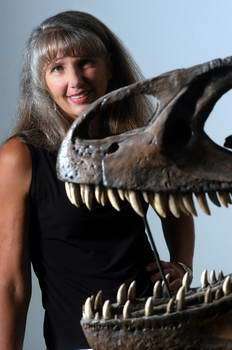 The discovery not only means that B. rex was female, but it signifies the end of a scientific treasure hunt, according to Schweitzer who announced her discovery in the June 3 issue of the journal Science. Image: Mary Higby Schweitzer with the cast of a Tyrannosaurus rex. (Photo courtesy of North Carolina State University). Researchers have long predicted they would find medullary tissue in dinosaurs, but they hadn't found it until it appeared in the hind thigh bones of B. rex, Schweitzer said. Scientists expected to find the tissue in dinosaurs because other evidence linking birds and dinosaurs is so robust and all female birds have medullary tissue. "It's pretty cool," Schweitzer said of the B. rex finding. "It gives us a window at how these guys were actually functioning." Medullary tissue lines the inside of bone marrow cavities and keeps birds from losing calcium while they lay eggs, Schweitzer said. Without the tissue, birds would develop osteoporosis when calcium left their bones to provide mineral for egg shells. This could be lethal for flightless birds that depend on their legs to move around, since calcium removal would leave the bones weak and full of holes. "This is actually a real problem for commercial layers," Schweitzer said. "Basically, during the laying cycle, a bird must mobilize the equivalent, given size, of a woman being pregnant for 18 months and nursing the whole time. That's a lot of bone mineral." B. rex was discovered north of Jordan in 2000. The oldest Tyrannosaurus on record, it is believed to have died 68 million years ago when it was between 16 and 20 years old. It was named after Bob Harmon, chief preparator of paleontology at MSU's Museum of the Rockies. Jack Horner, curator of paleontology at the museum and co-author of the Science article, said during a May 31 teleconference for the American Association for the Advancement of Science that, "We have opened up an awful lot of bones (in MSU labs) and we have never seen anything like this in any other dinosaur before this T. rex. We will keep looking and hopefully we will find another dinosaur with it." Schweitzer said Horner had sent her a box of B. rex bone fragments, and she knew as soon as she opened it that the dinosaur was female. She had examined enough bird bones and knew enough about bird biology to recognize the distinctive tissue. "We have a girl," she announced to her technician, another co-author of the Science paper. Schweitzer inspected the bones with a variety of tests that partially removed minerals and left tissue. She also compared the dinosaur bones with the bones of emus and ostriches that died during their egg laying cycles. She found the birds after advertising on a web site for ostrich and emu owners. Ostriches and emus are primitive birds that have more in common with dinosaurs than more advanced birds like robins, Schweitzer said. The thickness of the medullary tissue varied among the birds and B. rex, Schweitzer said. She wasn't sure, however, if the size of the animal or time of death during the laying cycle made the difference. Horner said no T. rex eggs have ever been found. Schweitzer said she was trying to get at the microstructure of the bone by partially removing the mineral when she came across the soft tissue and blood vessels that led to her first paper in Science. That paper was published March 25 and led to a storm of publicity because the finding was significant, unexpected and controversial. "It was surprising how much interest the first paper generated, perhaps because people have predicted that this (medullary) bone tissue would be present, while no one expected soft tissue," Schweitzer said. Schweitzer and her technician are using MSU and Museum of the Rockies laboratories this summer to further analyze the B. rex bones. Schweitzer expects the bones will lead to more discoveries, but declined to give details.